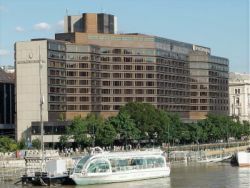 In Budapest, we'll be staying for 2 nights at the InterContinental Budapest Hotel. Located beside the landmark Chain Bridge along the charming Danube Promenade, and with dazzling views over the Royal Palace and the magnificent Budapest riverscape, the hotel boasts one of the city’s most sought-after locations close to the Váci shopping street, the Central Market Hall and the Gellért Baths. The hotel offers an indoor pool, 24-hour gym, spa and wellness center, business center, an on-site ATM, currency exchange, laundry and dry-cleaning service, beauty shop, bar, and on-site restaurant with Hungarian or modern fusion cuisine. The 402 elegantly furnished rooms feature sleek interior design and are equipped with a satellite TV, tea and coffee-making facilities, mini bar, mini refrigerator, work desk, WiFi Internet, and individually-controlled A/C. The bathrooms feature a bathtub, hairdryer, scale, plush bathrobe, and luxury toiletries. While in Vienna, we'll be staying for 4 nights at the Hotel Ambassador, a historic property located in the center of Vienna, within walking distane to many of the city's famous sites, including St. Stephen's Cathedal, the Hofburg Imperial Palace, the State Opera and the elegant shopping street Kärntner Straße. Built circa 1889, the Ambassador Hotel has hosted many celebritites, such as Josephine Baker or Mark Twain. The Atrium Bar serves specialty cocktails, and the open kitchen restaurant serves excellent local cuisine accompanied by views of the Neuer Markt, the Winter Garden and Raphael Donner's fountains. The 89 stylish guestrooms have been recently refurbished with fine dark woods, antique furnishings, latest technological solutions and are extremely spacious. All rooms are outfitted with A/C, satellite TV, phone and voicemail, safes, free WiFi, a minibar and offer room service. The stylish, modern bathrooms come with complimentary toiletries and hair dryers. In Prague, we will be staying for 3 nights at Hotel Pod Vezi. 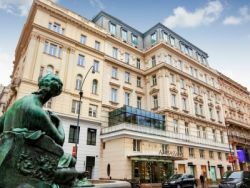 The hotel is located in two historical buildings in the center of Prague, at the end of Charles Bridge, in the atmospheric Lesser Quarter neighborhood. 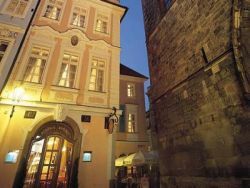 The hotel's unique location puts you both in the very center of the medieval town with sweeping city and castle views, yet on a quiet corner hidden behind the Gothic Malostranska Tower. The hotel offers an upscale, on-site restaurant, free Wi-Fi connection in all rooms and public areas, elevator, non-smoking rooms, and room service. The roof terrace offers panoramic views of the bridge. The 28 modern and relaxed rooms have individually-controlled air-conditioning, private bathrooms with elegant toiletries and dair-dryers, satellite TV, minibars, and coffee and tea making facilities.